Much to the surprise of many Americans, New Haven, Connecticut is actually a hotbed for pizza. The dish even has its own name in the town: apizza (pronounced as ah-beets). New Haven pizza is of the thin crust variety, similar to the New York City style, except its more haphazard in shape. Mozzarella and tomato sauce aren't always a given, either — white pies topped simply with garlic and clam got their start here and have thrived in popularity over the years. The pizza also comes more well done than usual — the locals refer to the darkened crust as charred as opposed to burned. There are other places serving up great pies in New Haven, like BAR or Modern Apizza, but the debate in the city's streets always comes down to Frank Pepe Pizzeria Napoletana (aka Pepe’s) vs. Sally's Apizza (aka Sally’s). Here's our take on the rivalry. Pepe’s opened in 1925 and started the whole New Haven pizza craze. Frank Pepe came over to America as an immigrant from Italy’s Amalfi Coast. After going through a couple of other jobs, Frank decided to get into the pizza business and eventually opened his own storefront. Sally’s was opened in 1938 when Pepe’s sister Filomena decided to get into the pizza business right down the street from Pepe’s. Salvatore Consiglio, Filomena’s son, and Frank Pepe’s nephew, jumped ship from his uncle’s pizzeria and moved over to his mother’s joint. Advantage: Pepe’s — There's no competition when it comes to the original creator of New Haven pizza. Plus Salvatore jumped ship, so he knew where it all started. The locations for both Pepe’s and Sally’s haven’t changed much over the years. The original Pepe’s location that opened in 1925 is still open and thriving. It’s known as “The Spot” and generally gets less traffic than the new location. The new location is actually very old itself as it was built in 1937, but it’s the main location for Pepe’s these days. The pizza coming out of both locations is the same recipe. The main location has two dining rooms, so there’s plenty of space. The booths are old school and the walls are covered with photos of the history of the Pepe family. Sally’s offers a smaller location than the main location of Pepe’s, but it has a similar charm. It seems straight out of the '70s or early '80s, with padded booths and wooden walls. Advantage: Sally’s — Pepe’s loses a little cachet for moving out of their original location, but the real kicker is that they’ve now opened multiple locations in Connecticut, Massachusetts, and New York. An experience at Sally’s is the only Sally’s experience you can enjoy. Its vintage look is also more enjoyable. In true New Haven fashion, both Pepe’s and Sally’s char their crust. Both crusts have the thin look and classic chew that you expect when biting into a slice of New Haven pizza. Pepe’s dough is proclaimed to be a secret family recipe, but now 20-30 people really know about it because of the expansion. It’s thin but still bready. Sally’s crust is right up there with Pepe’s, but you would expect that given that the family recipe was passed down many years ago. Sally’s tends to char their crust slightly less than Pepe’s does. Advantage: Sally’s — It’s a very slight edge, but the char without too much burn makes a difference. You want to eat the crust, not burnt dough. People often talk about how they finish their crust at Sally’s even though they don’t normally finish it anywhere else. Don’t ask Gary Bimonte, Frank Pepe’s grandson and the current owner, where Pepe’s gets their tomatoes. He won’t tell you. All he’ll say is that it’s a proprietary blend of Italian plum tomatoes that only Pepe’s has access to. Pepe’s takes pride in its sauce and you can see that by how close to the vest they keep the details. Pepe’s keeps it so close to the vest that they don’t put as much sauce on their pies as Sally’s does. And don’t think Sally’s puts too much sauce on there either. It’s the more appropriate amount as opposed to Pepe’s. It also has a tang to it that evokes the craving feelings that make you want to go back. Funnily enough, Bob Consiglio at Sally’s won’t tell you much about his ingredients either. Most people will argue, however, that Sally’s has the best tomato pie around and that pie is where it all started in the New Haven pizza business. When it comes to cheese, the key thing is you need to ask for it. Regular New Haven pies come with just a few shaves of parmesan or pecorino cheese to go along with all the sauce and crust. Sally’s uses shredded mozzarella, while Pepe’s uses big rectangular slices. Maybe it’s those rectangular slices that negatively influence the cheese-to-sauce ratio that make it feel like it doesn’t have enough sauce. Advantage: Sally’s — It’s hard to argue with the appropriate sauce-to-cheese ratio. Pepe’s just could use a little more sauce and the playing field might be more level. The extra tang on Sally’s sauce definitely makes you feel all warm inside. The number one topping in New Haven is clams and Pepe’s clam pie made the type of pizza legendary in the area. Pepe’s goes through 1,950 clams a day and they’re all shucked in-house. All the cherrystone clams are harvested locally, but they won’t tell you where they’re from exactly. Pepe’s also gets proprietary sausage made, but don't ask where that's from, either. (So many secrets in these parts!) Otherwise, it’s the usual suspects of meats, vegetables, and other pizza accouterments. Sally Consiglio used to refuse to make pizzas with more than three ingredients, but if you like plenty of toppings, you’ll be happy to know that you can order freely these days. There is still some tradition in the fact that Sally’s offers fewer toppings than Pepe’s does. They do offer tuna, which may never actually be ordered. 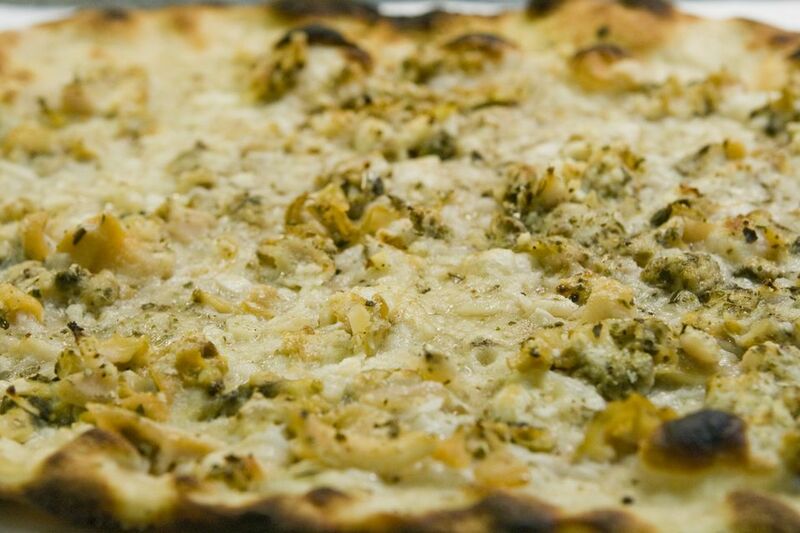 Advantage: Pepe’s — It’s the best clam pie in the business for a reason. You can’t go wrong with those freshly shucked clams and garlic. We’re almost 100 years since the inception of New Haven pizza and it’s quite amazing that the dish's quality has held up so well over the years. The battle over who is best rages on, but the two locations (along with the other pizza joints in town) are pretty friendly with each other. Unfortunately, a decision needs to be made and being friendly isn’t an option. Advantage: Sally’s — Frank Sinatra was a Sally’s guy. Isn’t that all you need to know? Just kidding, of course, but the true essence of a pizza comes down to a combination of three things: crust, sauce, and cheese. Sally Consiglio had it right when he refused to make a pizza with more than three toppings. Pizzas at their core come down to the basic ingredients and Sally’s has the edge with the combination of the three.